The summary reveals a departure from Jem’s original backstory to fit the times. Gone is the empowered heroine who pulled double-duty as head of her own record label and moonlighting as a pop star. Also missing is any reference to the Misfits, the Holograms’ bad-girl rivals. Instead, it sounds like the band starts off as YouTube rubes who become the pawns of a manipulative music studio, only to break free and find their own voice. This refreshing, “one-in-a-million journey” seems to follow the narrative path blazed by contestants on American Idol (and leaving open the possibility that Jem will run for Congress in the sequel). 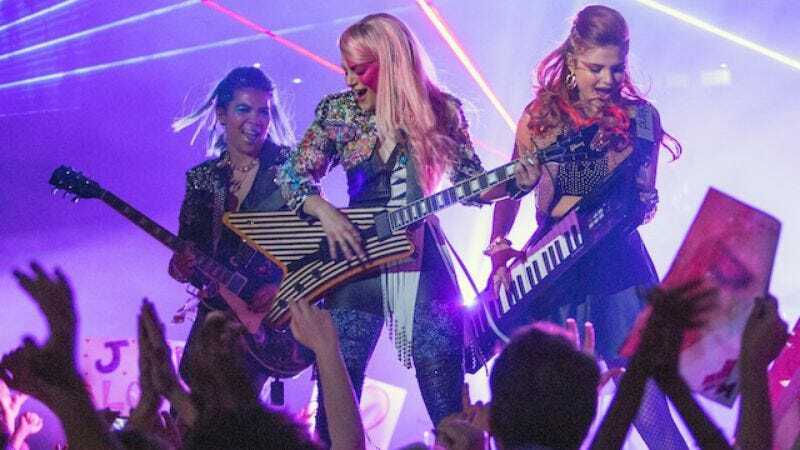 Given the updated premise and high-res image, it’s not a stretch to guess that the enigmatic Synergy pulling Jem’s strings will be unmasked as the corporate synergy created between the Holograms’ manager, the Bedazzler industry, and Universal Pictures’ marketing department. Jem And The Holograms will be projected onto movie screens—and our hearts—on October 23, 2015.